Swiggy Order Alerts on WhatsApp?? Swiggy will now test WhatsApp’s enterprise solution, and help provide quick real-time alerts on user orders via the Facebook-owned messaging update. The food delivery service is rolling out this feature, and some users would have already started receiving messages on WhatsApp. 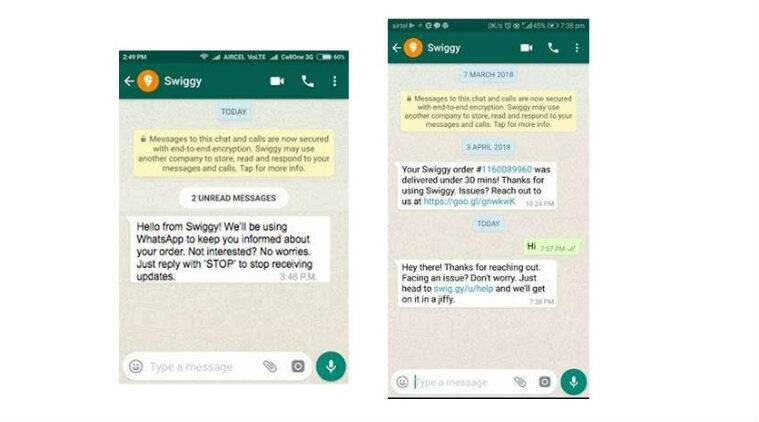 Under WhatsApp’s enterprise solution that provides real-time alerts, Swiggy app users can rely on the Swiggy chat window for exclusive updates within the app. The WhatsApp service via Swiggy will provide regular updates like ‘order accepted’, ‘order in kitchen’, ‘delivery in process’ and ‘order delivered’. So instead of Swiggy sending text messages via SMS, it will now rely on WhatsApp for the same. WhatsApp’s feature will support the app’s map-based delivery tracking system, which provides a real-time update of a Swiggy delivery rider’s location. If users do not wish to continue with the feature, they can respond with the message ‘STOP’ on Swiggy’s WhatsApp chat window.